This is dairy-free, very low in saturated fat, and rich in vitamin C and the antioxidant betacarotene. 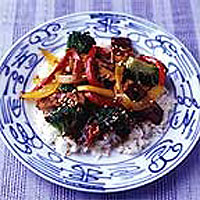 Mix the soy sauce, vinegar, sugar, chilli and five-spice powder then add the tofu and coat well. Cover and marinate for 1-2 hours if possible. When ready to cook, drain the tofu, reserving the marinade. Put the rice to cook, following pack instructions. Heat a wok with half the groundnut oil over a high heat. Add the tofu (you might need to do this in batches). Stir-fry for 1-2 minutes until golden then remove to a warm plate. Add the remaining groundnut oil to the pan, then the peppers, broccoli and sesame oil. Stir-fry for 3 minutes or until just tender. Stir the cornflour and water into the reserved marinade and add to the pan, along with the tofu. Cook briefly until thickened. Add a little hot water if needed to give a rich sauce. Serve with the rice, scattered with sesame seeds. Breakfast: Low-fat yogurt with honey. Lunch: Mackerel fillets in oil, well drained, with a leaf salad and cherry tomatoes. Protein: 15g; Carbohydrate: 62g; Fibre: 3.5g.